Vermont offers many vacation property opportunities. If you are looking to buy a Bungalow or 3 Season Camp you have come to the right place. 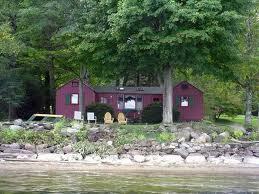 The shores of Lake Champlain are lined with smaller properties, many with private beaches and dock space. Moreover, the Green Mountains offer many private retreats for enjoying the wonder of Vermont wildlife. Available Vermont Cabins are listed below. Classic three bedroom panabode with 115' east facing lake frontage. This cedar log home sits on a generous .6 acre lot surrounded by agricultural land, giving it a nice sense of privacy and protection from any development happening close by. Enjoy vistas of the Green Mountains as well as spectacular moon rises over Lake Champlain. A must see!